Is There a Conspiracy Against Ayn Rand? I am not a devotee of Ayn Rand. Let me make that perfectly clear and say it again: I am not a follower of Rand’s radical conservative philosophy, Objectivism. And I don’t consider Ayn Rand to be a great writer of fiction. I panned Atlas Shrugged in a review at amazon.com. I gave The Fountainhead a less-than-stellar review (see this site’s book review archives for the complete review). But, as with most things philosophical and political (save for Nazism: there’s no saving grace is a deception meant to annihilate an entire race of human beings), there’s a grain of truth behind Rand’s not-so-subtle message: that allowing men and women to reach their own personal potential through economic freedom, commerce without regulation or constraint, allows humanity as a whole to reach its zenith. But that having been said, I loved the film version of The Fountainhead starring Gary Cooper (again, see the archives of this site under “movies” for a full review) and when I learned that Rand’s greatest work was being put on film, I eagerly waited to see it. Well, Atlas Shrugged Part I was released last fall, was here, in Duluth, at Zinema2 for a moment, and then disappeared. Outside a few positive words from folks on websites (most of them Rand followers), there was little good said about the film. Well, I’m here to set the record straight: This effort from director Paul Johannson, though considered a low budget affair, is one sleeper of a film. First, let’s start with the fact that, given the liberal vibe of Hollywood, a place unlikely to worship the teachings of Rand (which are followed by conservative icons like Congressman Paul Ryan, Supreme Court Justice Clarence Thomas, and former head of the Federal Reserve, Alan Greenspan) it’s miraculous that this film got made at all. Yes, it’s true, it made it to screen on a purported six million dollar budget. That’s like, what, the cost of James Cameron’s lattes during the filming of Avatar? 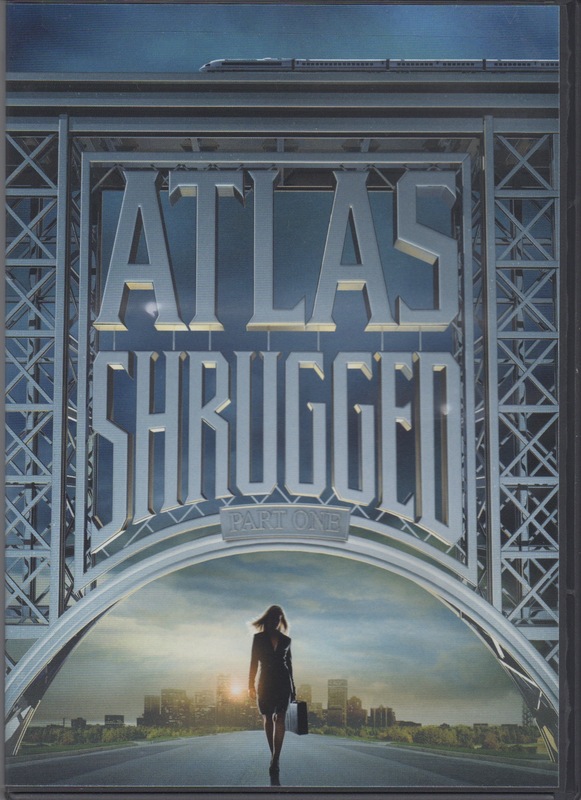 But that’s one of the charms of Atlas: for its low cost, the movie’s computer graphics (primarily scenes of the John Galt Line) are terrific: very real and breathtaking. The acting, particularly by the three main faces on the screen, Taylor Schilling as Dagney Taggart (lovely, smart, and cast dead on as Rand’s strong female protagonist); Grant Bowler as Henry Reardon (again, a first rate, little known actor who is perfect for the part); and well known character actor Graham Beckel (who you’ll recognize from hundreds of television appearances and movie parts, playing oil tycoon, Ellis Wyatt). The cinematography is also excellent, with great shots of industrial and pastoral settings that give the movie a documentary feel, albeit one with a deep message and superb acting. There are no long speeches or rants in this section of the planned three part film (Parts II and III are in production, but more on that later), just quiet lessons from the pen of Ms. Rand on why the socialism and collectivism that she endured as a citizen of Soviet Russia is so damn evil and why unrestricted capitalism is so damn good. Understand: The dialogue does not bludgeon you over the head to make these points. Rather, you are indoctrinated into Rand’s view of the world through the actions and minimalist dialog of Dagney Taggart and the other characters. So what are the problems with this film? Well, for beginners, the paperback version of the novel comes in at 1,200 pages and over three pounds of paper! Quite a hefty book for one as poorly written as Atlas is. But that’s the material Johannson had to shape into a 97 minute film. By way of contrast, The Fountainhead, Rand’s other major work, though still large by contemporary attention span standards, is a little over 700 pages and weighs in at less than a pound and a half. King Vidor was able to take that mountain of words and papyrus and craft a wonderful movie back in 1949; a film which still manages to entertain because of great acting and production qualities. 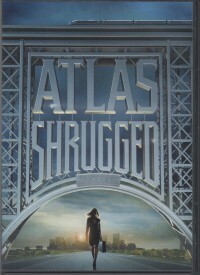 My point here is that Atlas Shrugged rivals some of the largest fiction tomes ever set to type: Perhaps, given the book’s size and intricacies, a better “fit” for the story would have been a television mini-series such as was used for Roots or Lonesome Dove or The Thorn Birds. It’s not that the ending of Part I doesn’t make sense or leave the viewer begging for more: The film doesn’t suffer from those problems. But if you go to the IMDB website and scan the production details regarding Atlas Shrugged Part II ( http://www.imdb.com/title/tt1985017/) you will see trouble brewing: None of the principle cast members is coming back! I don’t know about you, but, in my humble view, replacing Tommy Lee Jones and Angelica Huston with Jon Voigt and Barbara Hershey in Return to Lonesome Dove destroyed the sequel to the greatest Western ever written. Because I’ve seen Atlas I and appreciated Ms. Schilling and Mr. Bowler in the key roles, tossing other actors into those parts in the continuation of the same story (not a sequel, you understand, but the same plot and story), makes me reluctant to spend my time or hard earned cash to see Part II or Part III. The producer, whomever he or she is, may pull it off. But with all the controversy surrounding Rand and her philosophy in this, a presidential election year, does Rand’s legacy deserve a less than full-tilt effort? I’m not a fan of the woman’s thinking but I want her message to be heard. For without considering the positions of folks we don’t agree with, we Liberals will be reduced to watching talking heads on television who spew only what we want to hear. That’s no way to reach compromise and govern a nation and I am troubled that the folks behind this trilogy didn’t have the common sense, the economic good judgment, if you will, to sign the principles up for all three segments of the movie depicting Rand’s greatest work. Denzel Washington is our generation’s Sidney Poirtier: An African American actor and director of such talent and focus that his work can change the fabric of our society in how it sees itself and its history. From his debut in Glory as a young union soldier, to his portrayal of a homophobic attorney in Philadelphia, to his riveting performances of such diverse black men of history as Malcom X (Malcom X) and Frank Lucas (American Gangster) and a myriad of roles in between and thereafter, Mr. Washington has achieved enormous success on the screen as a leading actor and in character roles. But in this older chestnut of a film, Washington not only provides another solid, understated performance of a troubled African American role model (a Marine psychiatrist treating a seaman’s anger), he directs a film that few saw in the theaters and few have rented on NetFlix or as a DVD. And that, folks, is a real shame. Derek Luke (starring in his first feature film) portrays Antwone Fisher, a real-life sailor on a Navy amphibious assault ship (the Belleau Wood; think small aircraft carrier for helicopters), who comes from a troubled past that he’s never confronted. Washington plays Dr. Jerome Davenport, the Marine psychiatrist that Fisher is sent to see after a racial altercation on the Belleau Wood. But the good doctor himself is troubled: Deftly, screenwriter Fisher and director Washington don’t reveal what ails Washington’s character: We just know there’s something a’brewing with the physician who cannot, or will not, heal himself. Luke is perfect as Fisher: Physically strong, emotionally explosive, and dead on as he tries to confront years of abuse experienced at the hands of his foster mother and foster sister while growing up in Cleveland. Washington is his usual solid self as Davenport, flashing anger when necessary but generally playing it straight in an attempt to help young Fisher unravel the past. The supporting actresses are extremely gifted in their limited roles and James Brolin wanders in for a cameo at the beginning of the film but, by and large, this is Luke and Washington’s film and it is a dandy. My wife, who is a mental health therapist, was balling throughout the picture. I held off until near the end but, even this jaded District Court Judge wept as the film spun to conclusion. A fine, fine piece of movie making that shows a film of substance can be made by a black director and a black screenwriter (featuring an essentially all black cast) without resorting to graphic violence, unnecessary cursing, or relying upon stereotypical behaviors. Why this film didn’t do well or win awards is beyond me. Rent it today! My wife bought the DVD version of this parody/docucomedy based upon Jon Ronson’s bestseller about his encounter with “counter culture operatives” he came into contact with as he tried to embed himself with US forces in Iraq during the early stages of the Iraq War. 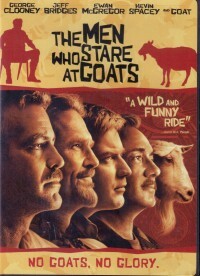 The title comes from a covert experiment run by the US Army where a group of elite soldiers (who were believed to possess psychic powers) stared at goats in an attempt to stop the animals’ hearts. George Clooney is Lyn Cassady, the ops guy who Bob Wilton (the fictional version of Ronson in the movie played by Ewan McGregor) “bumps” into on his attempt to enter Iraq as a reporter. From the first moment, you know that this is no ordinary war movie. If you are looking for Battle of the Bulge or Gettysburg in this film, you won’t find it. But if you loved Clooney in Oh Brother, Where art Thou?, you will thoroughly enjoy this sardonic look at how the military industrial complex thinks in post-Vietnam America. I’ll admit to being a skeptic: the title alone caused me to deride my wife for buying the DVD from Target’s discount bin. But I know when to admit (especially when it comes to my wife) I was wrong. So here it is: Rene’, I was wrong. Clooney is wacky and engaging in his role. Jeff Bridges is at his unstable best in a part reminiscent of his past forays into comedy (think Big Lebowski). As the commander of the unstable unit engaged in the “Warrior Monks” experiment that molds Clooney’s character, Bridges is terrific. My only criticism is that the foil in the film, Kevin Spacey (another Oscar winning actor) doesn’t hit the high notes in his performance. In my view, Spacey is slightly miscast as the ostensible villain of the tale: He plays serious far better than he plays funny. But if your looking for a comedic look at war that leaves you grateful to your wife, husband, kid (pun intended), or significant other for bringing home this film, take a look. You won’t be disappointed. If you’re a fan of the original Law and Order television series, you’ll recognize Elizabeth Rohm as one of the many young female assistant DA’s who have been at the side of lead prosecutor Jack McCoy during the long run of that program. Here, in a modern-day rendering of Tolstoy’s once scandalous story of love, passion, and obsession turned homicidal, Rohm plays Abby, a concert pianist turned mother and housewife, whose rich, older philanthropist husband, Edgar, cannot help but believe (given Abby’s beauty, ardor, and the age difference between them) is having an affair with a young violinist. Though the story is set in contemporary LA, with a series of beautiful modern homes as backdrops for steamy scenes between Edgar (played by Danny Huston) and Abby, the plot closely follows the psychological underpinnings of the original novella. The tale is an old one (admiration and love gone awry) and it is well played by the actors in this sleeper of an independent film. The intimate scenes are nearly pornographic: One has to wonder how Rohm and Huston pull them off without actually engaging! Rohm’s depiction of Abby, while not Oscar worthy, certainly hits the right note and it’s refreshing to see a natural, female body on the screen rather than one that has undergone cosmetic “enhancement”. Huston is terrific as Edgar, playing the brooding, jealous husband with sufficient nuance to pull off the difficult character that Tolstoy created. It’s not an easy thing to make a viewer care about a homicidal husband but, by playing the part as Tolstoy wrote it, we are compelled to understand Edgar’s obsession and his ultimate surrender to rage. Spoiler alert: Though Angelica Huston is given third bill on the cover of the DVD, her role is no more than five minutes and has little to do with the underlying plot. I’d suggest any fan of the novella will not be disappointed by this repackaging of one of Tolstoy’s most shocking (when it was finally published after years of suppressing censorship) stories. The Kreutzer Sonata is the sort of surprising film that gives credence to the need for places such as Zinema in my hometown of Duluth, where independent films are shown. My only major criticism is that Rohm appears to be pretending to play the piano as she and Aidan (the violinist) practice the Beethoven piece that captivated Tolstoy to write the novella. It would have been nice to see Rohm put in the same time and effort that Jeff Bridges did to his guitar playing and singing in Crazy Heart. One final note, you may have difficulty finding this film in the theaters or on DVD. It appears it is not available in the US market as a DVD but it can be found on NetFlix via streaming video. This review refers to the Mongrel Media release which is a Canadian distributor. I purchased my copy through Amazon.ca. Be aware that the version displayed at Amazon.com is formatted for the European market and will not play on a North American DVD. It’s a good thing Robert Redford wasn’t directing movies back in 1948 and that King Vidor was. Why? Because of Redford’s insistence on changing the endings of dark, beloved literary masterpieces for film. Ever seen The Natural? Or the Horse Whisperer? Great books both and fairly good movies as well. But in both cases, Redford let his Disney-like sentimentality get the better of him and change the ultimate message of the movies by changing the climactic endings. King Vidor, likely because of Ayn Rand’s strict contractual agreement with Warner Brothers (that no part of the dialogue she adapted from her novel for the film be altered), didn’t detour much from Rand’s intent or basic story. Of course, a philosophical tome depicting the virtues of Objectivism (selfishness) based upon the tension between a newspaper writer and an architect could well have ended up a mush pile of gibberish. And at times, Rand’s message does get in the way of the cinematic brilliance of Vidor’s adaptation. But Gary Cooper’s acting is superb: Cooper is Howard Roark, Rand’s superhero individualist. And Patricia Neal? No wonder Cooper fell head over heels for her, both as Roark and in real life. She, in my humble estimation, propels the film forward, giving it sexual tension and vibrant reality when the dialogue and story could have easily doomed the picture to a vault on the Warner Brothers lot. Raymond Massey also does a fine turn as Gail Wynand, the newspaper tycoon who ultimately tries to save Roark from those who would destroy him. The sets are awesome despite the primitive technology of the 1940s: The models and lighting and mood accentuate Rand’s themes. The use of black and white photography is spot on because King Vidor made his name in the silent film era and there is much about this movie that reminds me, at least stylistically, of Fritz Lang’s masterpiece, Metropolis. While my review of the book isn’t a five star review (mainly due to the way the plot and story get bogged down in the course of Rand’s rants), this movie is a must see. It is truly an under-appreciated work of art. Buy or rent the DVD so you can watch the “Filming of…” short film. It’s well worth the price of the disk on its own.